Representations of music were employed to create a wider ‘Orient’ on the pages, stages and walls of nineteenth-century Britain. 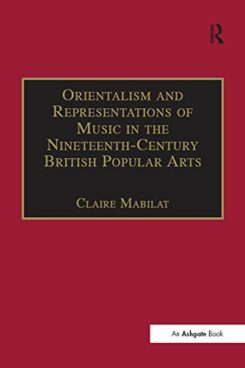 This book explores issues of orientalism, otherness, gender and sexuality that arise in artistic British representations of non-European musicians during this time, by utilizing recent theories of orientalism, and the subsidiary (particularly aesthetic and literary) theories both on which these theories were based and on which they have been influential. The author uses this theoretical framework of orientalism as a form of othering in order to analyse primary source materials, and in conjunction with musicological, literary and art theories, thus explores ways in which ideas of the Other were transformed over time and between different genres and artists. Part I, The Musical Stage, discusses elements of the libretti of popular musical stage works in this period, and the occasionally contradictory ways in which ‘racial’ Others was represented through text and music; a particular focus is the depiction of ‘Oriental’ women and ideas of sexuality. Through examination of this collection of libretti, the ways in which the writers of these works filter and romanticize the changing intellectual ideas of this era are explored. Part II, Works of Fiction, is a close study of the works of Sir Henry Rider Haggard, using other examples of popular fiction by his contemporary writers as contextualizing material, with the primary concern being to investigate how music is utilized in popular fiction to represent Other non-Europeans and in the creation of orientalized gender constructions. Part III, Visual Culture, is an analysis of images of music and the ‘Orient’ in examples of British ‘high art’, illustration and photography, investigating how the musical Other was visualized.